This page has been created as part of a project to put planetary control networks on the web. This control network for Jupiter’s moon, Ganymede, originated from Merton Davies and Tim Colvin at the RAND Corporation and was provided to the USGS in 2000. The control network solution was originally performed with software developed at RAND, and documented by Colvin (1992). It has been converted into files that could be used with (successively) the RAND/USGS Planetary Geodesy (RUPG) Software, and the USGS ISIS2 software (using the application, described by Edmundson et al. 2012). Each control network is essentially a set of photogrammetric solution (input and output) files. The input files consist of, aside from a priori information, measurements of common points (control points, sometimes called tie points) on images of a planetary body. The output files include the body coordinates of the control points in latitude, longitude, and radius, and revised orientation information (camera pointing) for the images. The primary use of such information is for the creation of image mosaics of the planetary body. However, these solutions can also provide fundamental data on the size and shape of the body, its rotation period, and the direction of its polar axis in space. The control point coordinates also usually serve as a coordinate reference frame that defines the fundamental coordinate reference system for the body in question. Formatting of this control network data for Jupiter’s moon, Ganymede, has been updated for compatibility with the USGS ISIS2 cartography software. This network consists of 12,890 control points and incorporates 295 images from the Voyager I and II missions. The RAND control network available here is the 1995 version of work first described in (Davies et al., 1979); the USGS versions used this RAND network as a starting point. This release is comprised of data from original RAND control network solutions, the USGS ISIS2 qmatch-formatted control network, Voyager I and II images (processed to ISIS2 format), ISIS scripts to process PDS (.imq) images into the ISIS2 format, and file-format description files. This global mosaic of Ganymede utilizes the best image quality and moderate resolution coverage supplied by Galileo Solid-State Imaging (SSI) and Voyager 1 and 2. 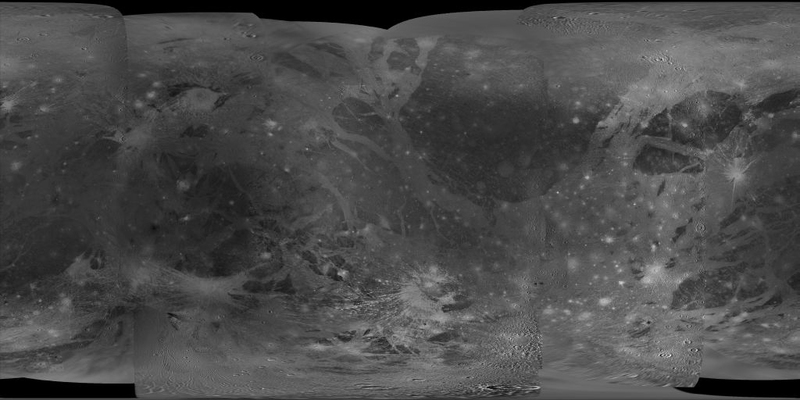 This mosaic was prepared by the USGS Astrogeology Science Center using the ISIS 2 image processing and cartographic system. The image data was selected on the basis of overall image quality, reasonable input resolution (from 20 km/pixel for gap fill to approximately 400 meters/pixel), and availability of moderate viewing and sun angles for topography. Created as part of a project to put planetary geodesy control networks on the web. The Ganymede Voyager control network data here was originally provided by Merton Davies and Tim Colvin of the RAND Corporation. Funds were provided for a conversion and archiving effort by the NASA Planetary Geology and Geophysics Program and the NASA Cartography Program. Contained in the ZIP file are the necessary data to open the RAND solution of the Ganymede control network in the ISIS2 qmatch format (.mat) and in its original RAND solution format. The ZIP file contains all necessary ISIS2 data to re-create the control network including ISIS2-formatted images. Scripts are provided to re-generate these images from PDS (.imq) format into the ISIS2 (.cub) format, if necessary. Ganymede_control_images.zip – All Voyager I & II images in the Ganymede control network, formatted as ISIS2 (.cub) files. che06.dat – RAND solution residual output file. gaxy0.dat – RAND solution image measurements (mm and pixels) input file. gaxy0.mat – RAND solution image measurements (mm and pixels) in ISIS2 qmatch match point format. version the line and sample columns have been transposed, and no data are altered. inp06.dat – RAND solution “poles, points, and positions” a priori input file. mea06.dat – RAND solution image measurements (mm) input file. out06.dat – RAND solution “poles, points, and positions” output file. mat2cnet. In this version, the exponential notation is expressed with E+/E- rather than D+/D-. Unused ‘junk’ spaces and hidden characters have also been removed; no data were altered. par06.dat – RAND solution program operation control input file. archived at pds.nasa.gov in PDS (.imq) format. Scripts to process these into ISIS2 (.cub) format are included here. ISIS-PG-FMT101_XXxy0_dat – Description of format of file gaxy0.dat (in PDF format). ISIS-PG-FMT101_XXxy0_mat – Description of format of file gaxy0.mat (in PDF format). ISIS-PG-FMT501_parXX_dat – Description of format of file par06.dat (in PDF format). ISIS-PG-FMT502_outXX_dat – Description of format of file out06.dat (in PDF format). ISIS-PG-FMT503_meaXX_dat – Description of format of file mea06.dat (in PDF format). ISIS-PG-FMT511_cheXX_dat – Description of format of file che06.dat (in PDF format). This is a global control network of Ganymede, and incorporates most of the usable images from the Voyager I and II missions. RAND solution files from the 1980’s are provided as *.dat files. The conversion to ISIS2 match point format (.mat) was performed in 2001 without making corrections or adjustments to the network.